Remote Alaska Tug and Barge Salvage - Global Diving & Salvage, Inc. Prompt action after a grounding can make the difference between a successful salvage and a total loss. 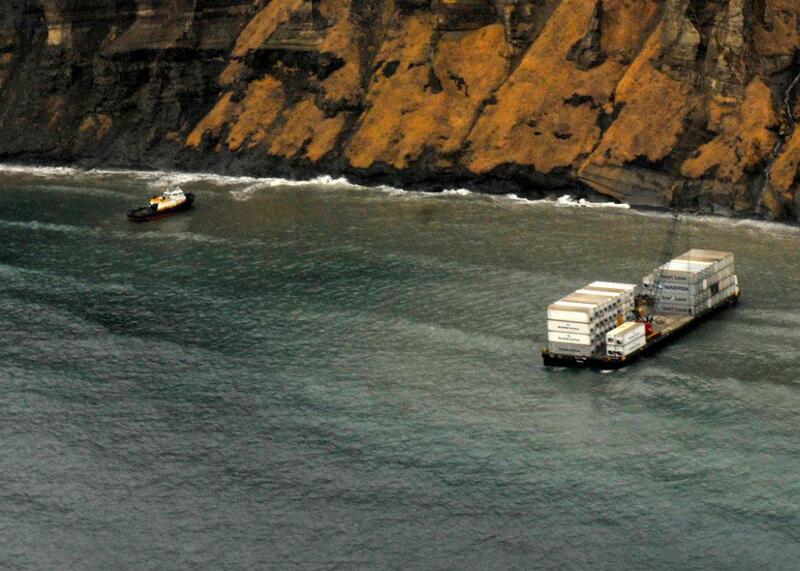 Global was called to respond to the grounding of a tug and barge on Ukolnoi Island, one of the Pavlof Islands situated within the remote Alaska Maritime National Wildlife Refuge near Pavlof Bay. Global mobilized two salvage masters, a salvage engineer, and salvage technicians as well as local responders to the site. Three towing vessels, one spill response vessel, a hydrographic survey vessel, two barges, two landing craft, two dive support vessels along with specialized salvage equipment were mobilized and participated in the operation. The exposed and inaccessible beach and varying weather and tides created a logistics challenge, requiring careful staging of personnel and equipment. Working closely with the client’s personnel, the bulk of the 97 containers were removed from the barge to lighten the ground reaction. All frozen containers were kept frozen and all cargo was salved. 14,000 gallons of diesel fuel were removed from the tug before temporary repairs were affected and it was refloated. Due to the condition of the barge’s damaged bottom plate, compressed air provided by specialized high capacity salvage blowers was used to refloat the vessel. The tug and barge were both taken to safe harbor for final disposition and repair.